Puffin photography! One of my main reasons for existence. What’s not to like about them? Their very soul is about lifting the spirit, whether it be through comedy or being just plain cute. I could photograph puffins for hours, and in fact I have done! If anything, I could spend a whole week photographing puffins. Something I would like to address this year, if I can get the time. The puffin photography you see here are from the Isle of May in July 2017. The Isle of May is a fantastic sanctuary for seabirds, which doesn’t see the number of tourists that the Farne Islands gets. If coming from the South of the Forth, the primary way to get there is to book a passage from the Scottish Seabird Centre in North Berwick. The Seabird Centre deserves a day on its own, so it’s well worth coming via this route. If coming from the North, then Anstruther in Fife has a nice straight forward ferry. I have used both, and both have their pluses. Go Anstruther if you like it nice and easy. Go North Berwick if you have a pepsi-max streak. This time I went via North Berwick. This is a form of covered speedboat that bounces over the waves – great fun! For those of temperate disposition, the constant bouncing may prove nauseating, so be warned! But it is quick, giving you more time on the island. On arriving at the jetty, we were greeted by David Steel a totally dedicated chap who has spent heaven knows how many years watching out for the welfare of seabirds in the UK. Following umpteen years at the Farne Islands, now the Isle of May is his base. This particular puffin photography visit was guided to make sure everyone stuck to the paths, but the guide was handy in pointing out particularly good areas to photograph. The Anstruther trip was pretty much free roam, which again has its merits. I love the ruggedness of the island – it reminds me of Cape Cornwall. Dramatic scenery with lots of weather. And the distinct lack of photographers means you get more room to get the puffin photography you want. You get longer on the island than you do on Staple Island or Inner Farne too. So it gives you more time to settle down in to your groove. If anything, the appeal of the Farne Islands has worn off for me, with the recent questionable activities of the National Trust. Last year they more than doubled the cost of getting on the islands. Also landing on Staple Island was refused due to excessive wind by the main jetty. This was despite a new jetty being built at great expense in a more sheltered location. The ferry operators were incensed that they had not been allowed to use it, and I don’t blame them. They made a special detour to show us this new jetty, which was way safer than the other one. To sour it even more for me, I was charged for two islands even though I was only allowed on Inner Farne. The National Trust should be ashamed of themselves. I hope that one day they hand the area over to the RSPB – a proper organisation dedicated to wildlife. Anyway, off my soapbox and on to puffin photography. The weather was bang on at the Isle of May, which was lucky. The spring/summer so far had been dodgy to say the least. After several hours wandering, shooting and resting, our trip was over before it even started. So much to see and practice my wildlife photography on. Puffins were in their thousands, not to mention razorbills, cormorants, shags and of course, the terns. Terns, beaks at the ready, dive-bombing everyone in sight. Wear a hat. These things hurt! Like I said, I could have happily stayed there a week and left, envious of those rangers and other specialists who remained. Maybe next year they’ll let me stay! 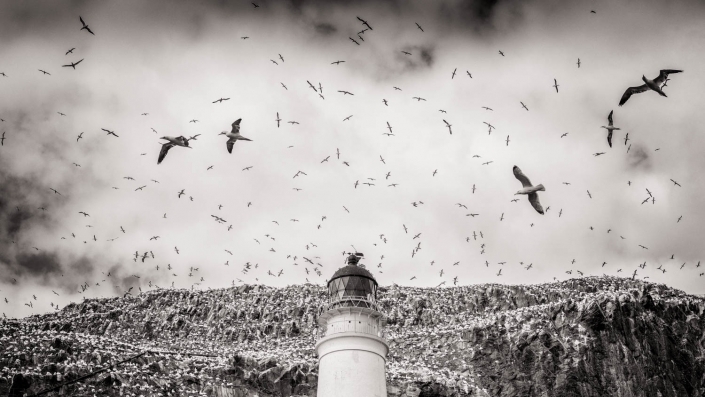 The trip was rounded off with a quick circuit round Bass Rock with its 250,000 gannet population. This was quite a staggering experience as the whole rock looked white from a mile out. Real estate on Bass Rock is no doubt at a premium! Landing here is definitely on my to do list for this year. Let’s see.